Synonyms: Alibertia sorbilis, Borojoa patino, Thieleodoxa sorbilis. Other names: Parvi grande, purui grand. 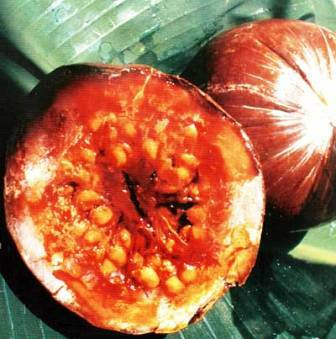 Borojo is a fruit of the Amazon region. It can be found wild as well as cultivated in commercial plantations. It seems to have been originated in the Amazonian region between Peru, Brazil and Bolivia. It is widely distributed in Western South America. 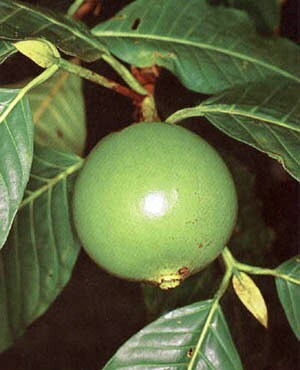 Borojo is being promoted as an energy fruit. It is also said to have aphrodisiac effect. So the demand for this fruit is increasing every year. A small evergreen tree, 3-5 m tall, boles upto 20 cm, branches opposite. Leaves single, opposite, elliptic ovate to oblong ovate, 25-45×15-21 cm, petioles 1.5-3.0 cm. Male flowers white, arising in leaf axils on short pedicels; female flowers sub-sessile on short pedicels. 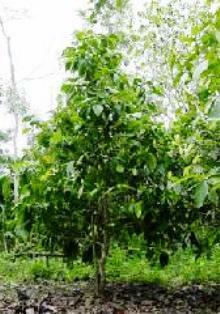 Fruit large, 7 to 12 cm wide, green; pulp brown, acid, and very dense, ripening on tree only. The fruit falls down when ripe. Seeds many, 90 to 600 embedded in pulp. Borojo is a highly energetic and nutritious fruit. It is reported to possess one of the highest levels of water soluble B vitamins among fruits. Boroja trees grow naturally in Amazonia in the rainy forests, on the rainy region of the Pacific coast of Colombia, where the annual average rain fall is more than 4,000 mm. Average temperature is 28ºC and the relative humidity 85%. It grows in the shade of other trees and adapts well up to 1,200 m altitude. So, naturally new plantations should be established where such environmental conditions exist. New trees of boroja can be raised from seed, cutting, aerial layering, or grafting.